Before everyone jumps one me – yes, culture isn’t DNA. 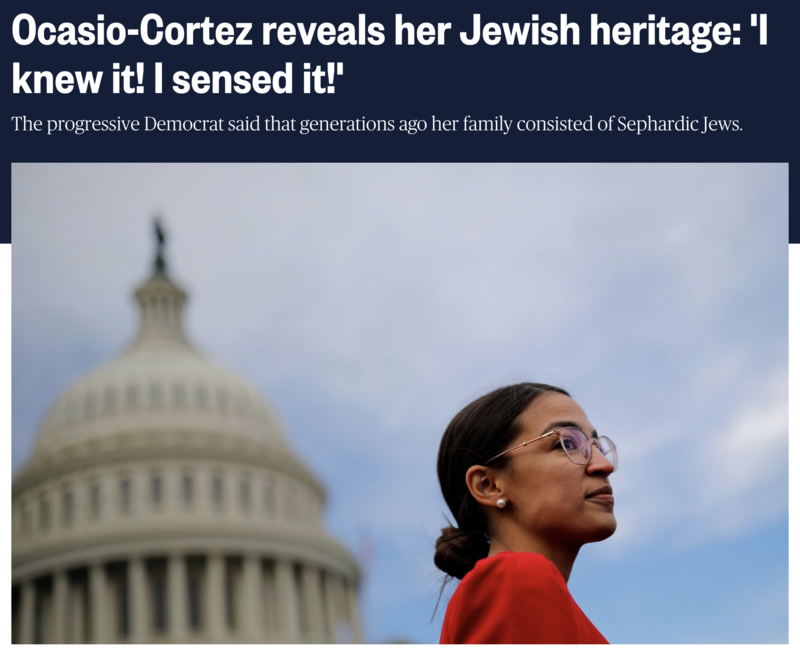 So Ocasio-Cortez may not have genes from Sephardic Jews but has Jewish culture? What does that mean? What it means, of course, is that she’ll pander to the Jews when it’s politically helpful, all the while opposing a two-state solution to the Israel-Palestine problem. My view: “DNA or shut up!” If she doesn’t have DNA evidence, she should have kept her gob closed, though going that whole Elizabeth Warren/ancestry route is dangerous. In a clear shift from proclaiming Israel has a right to exist during an televised interview on Saturday, Alexandria Ocasio-Cortez, the Democratic candidate from New York City, took a neutral stance on a two-state solution to the Israeli-Palestinian conflict in a live conversation on Sunday hosted by left-wing American news program Democracy Now! The 90-minute discussion was moderated by Amy Goodman and was also attended by Barcelona mayor Ada Colau Ballano. As I said, she’s the Sarah Palin of the Left. There’s even a bit of Trumpishness in her doing politics by Twitter. This entry was written by whyevolutionistrue and posted on December 10, 2018 at 2:15 pm and filed under lunacy. Bookmark the permalink. Follow any comments here with the RSS feed for this post. Both comments and trackbacks are currently closed. To quote the lame duck governor of Wisconsin: Molotov! Did Scott Walker actually say that?? I prefer a schlimazel, myself. If I recall correctly the way Leo Rosten broke it down, a schlemiel is the guy who always spills his soup; a schlimazel is the guy who always gets soup spilled on him. Listen up! Shlep: the guy who knocks the iron off the ironing board. Schlemiel:the guy whose foot it lands on. Schlemazel: the guy who says Tsk tsk tsk. Yeah, I saw The Death of Stalin at the theater when it was first released and thought it was a riot. I watched it this weekend. I’d been expecting a sort of slapstick and was surprised at just how dark it is. Apparently it’s historically inaccurate but so what? It captured the ‘feel’ of the events in a way that a documentary is unable to do, much in the way that the best debunking of conspiracy theories is through satire. It really captured the chaos of the succession. Yeah, the first time I watched it, I was expecting “In the Loop after Stalin died,” so I didn’t think it was nearly as funny. On second viewing, I realized how fantastic it is. It doesn’t get much wrong, but it does compress events into a much shorter timeline and adds a couple of events that didn’t really happen. Cool! Thanks for the video. So you won’t be sending her a complimentary membership in B’nai B’rith, boss? I wonder, given the anti-semitism within the left, whether this will help or hurt her. Jesús, María and Yosef, Alexandria Occasionally-Competent is now Alexandria Occasionally-Cohen. Amen…ded. This was her Hanukkah gift to the world. As with most gifts from narcissists, she didn’t really put much thought into it. Hey! I’m a nice Jewish boy. I’m going to be an astronaut doctor-lawyer some day. My point is, nice Jewish future astronaut doctor-lawyers like me don’t speak so uncouthly. You surely have never known me to enjoy raunchy joke. I have a reputation to uphold. I always assume that nobody ever remembers anything one says online anyway, so reputation does not come into it. But…has anyone ever noticed that our host uses a lot of British-English slang and non-U words – gob, bloody, etc.? (And btw, there is an alley in Bewdley, Worcestershire, called “The Gob”). Surely, most Americans do not normally use “bloody”? Is it my ignorance of US-English or am I right? Before anyone else writes it, “stiff upper lip” is an 1830s Americanism, apparently: I once read somewhere from a source which I found convincing at the time, before my pre-pre-dementia days. You’re correct that these are not normally used here in the US, Dermot. I know them well because I watch so many British TV shows and movies, but I doubt they’re even that commonly known here. They’re certainly never used in conversation. Does this, by her logic, also mean that she is a ‘Spanish colonizer’? Or should we rest easy knowing that she is a ‘likely other’. Makes no difference to me. I applaud her effort but think her age and lack of experience would be a drawback for a small- town councilwoman. I wish it was her age and lack of experience. The reality is that she is a successful and obvious product of “the studies”. What an ignorant narcissist. Between her and “the future is female and intersectional” Gillibrand, the future of the Democratic party is bright, intersectional, and female. Many women march await ahead of us to protest Trump 2020 and the next buffoon coming after him. P.S. : I am glad this one is not stupid unlike Sarah “fruit flies” Palin. She is young, we have to be patient. I would also like to apologize for not saying that I hate every conservative (the far right). I apologize for writing a message that may divert the attention from the real problems, instead focusing on a hard working Jewish womynx of several descents, that is trying to resist Trump and Quillette. As a cis-het-normative-performative white male I apologize. I will try to do better, although there will be a steady state privileged residual in me. Can’t ever get rid of that stain, white boy. Kneel before your new masters. You can surely say that up to a point you are culturally influenced by a culture without being so genetically. I know Westerners who lived for a long time in Japan who say that up to a point they have become culturally Japanese without claiming ancestry. I suppose that if she publicly converts to Judaism, like Ivanka Trump did, Prof. Coyne would be satisfied even without DNA. Why is it nobody ever discovers they are direct descendants of the oppressor classes? Did they never have children? How is everyone the great great grandchild of indigenous Americans but never a conquistador? Always a slave but never a slave-owner? Same reason reincarnated people are always famous people, and never the king’s piss-boy and whatnot. I’ve read people claim that they have slave-owners as ancestors. Actor Ben Affleck tried to coverup that an ancestor was a slaveowner. It didn’t work. Don’t know if that’s a fair argument – I’ve found that if anything, it’s been difficult to get white-passing Latinos to accept that they have mixed white, black, and indigenous ancestry. Younger Latinos have been better about accepting this, however, as people have become more aware of the history of racism in the Americas. People used to be reluctant to claim black or indigenous heritage unless it was blatantly obvious, but I now see more and more people claiming their mixed race ancestry. I think it’s a step in the right direction, since people in Latin America and the US have a long history of judging others by their skin colors (I’m thinking of the racism I’ve seen in my own South American family, who is white passing but clearly has really mixed ancestry judging by the diversity of the appearances of my close relatives). Hell, my cousins are apes. So somewhere hence I have Jewish ancestors. This is rank cultural, and perhaps genetic, appropriation, pure and simple. I think she wants to have her cake and eat it, too. Jewish ancestry won’t make her not a Catholic or make her support of BDS kosher. You make her for a converso? Uh oh, she might see the inquisitors if she’s caught lighting candles on Friday! A word of caution. Americans are not prepared to deal with a leftist like AO-C. Only when you hear people like Hugo Chavez (Venezuela’s former dictator), Nicolas Maduro (Venezuela’s dictator) or Gustavo Petro (runner up to the presidency last year in Colombia) you begin to understand their rationale. THEY ARE NOT STUPID LIKE THEIR COMMENTS SUGGEST (I apologize for the use of upper case letters but I must make emphasis on this) What they are doing is planting misinformation on people so when they are called for who they are, that is far left authoritarians who want to end democracy and basic freedoms, their constituents will not believe anyone else. It took Venezuelans many years to realize that Chavez and Maduro’s stupid comments were believed by millions of people who supported them until they ran out of food and it was too late. I believe that AO-C comments are believed in her district, and she will reinforce that with handouts and welfare, and that is all that counts to her. Ameircan liberals have never seen this kind of politics. I do not see how she can turn the united states into a venezuela, but she is definitely walking a path other have taken. Please, do not dismiss her as stupid or ignorant. She is not. Is that you, J. Edgar? I haven’t heard this kinda talk since the blacklists went outta style, since HUAC was finally euthanized. I am a descendant of Charlemagne. So are you, if you have any reasonable amount of European ancestry. In US, that’s much more than ‘just whites’. Many people love to have a ‘famous’ ancestor; but become deflated if that is Charlemagne or anyone living nearby there at least 1400 years ago, and if they carefully investigate solid scientific knowledge. Actually, you (as above) and I are both descendants of every human from what is now Europe 1400 years ago–rather, every such human who happens to have any presently living descendants. And that’s about 80% of all Europeans living to adulthood at the time. Charlemagne is known definitely to have a now living descendant (and that has little to do with him fathering > 17 children, among whom were Pippin the Hunchback, Hruodrud, Ruodhaid, Adelheid, and Hludowick–you remember them surely!). See Adam Rutherford “A Brief History of Everyone who Ever Lived” (2016), p.160-161 and nearby. I think there is every reason to be confident in Rutherford, this geneticist scientist/science popularizer. Anyway the original papers are referenced there. I’d be interested to hear a serious dispute of that last ‘confidentness’ I exhibited. So far as the DNA aspect of this type of thing is concerned, unless some pretty small upper bound is put on the allowable number of generations back one is allowed, the whole thing is a total crock. If the designation of some people as being Jewish began about 3000 years ago, I suspect there are very few USians alive now none of whose ancestors was Jewish. Even more jolting, the following is solid, even though contemplating the people just below makes one initially tend to disbelieve: present day Inuit inhabitants of Greenland; plus Australian Aboriginals or the recent Evangelist-shooting Sentinel islanders; plus remote Amazonian tribes. The surprising fact is that there was at least one human living only 3600 years ago who is the ancestor of EVERY human alive today; probably lots of such universal ancestors from, say, what are present-day Taiwan and Malaysia, to get you thinking how that might have happened, given the widely dispersed and ‘isolated’ groups above. So having a common ancestor for all humans alive brings us much closer to the present than the estimates of the time of “mitochondrial Eve”, where the line backwards is a very special one–maybe 50 times closer if I remember correctly. But how can she answer when she hasn’t met with the activists yet? She doesn’t know what they want her to say. Possibly true. But why should it matter? Oh, wait. You meant sensu Sagan. She just FELT it, so it must be true. After a few generations, like five or six, the fact that you are descended from one particular individual means practically nothing. You may not even have any DNA from that person. The further back you go the less it means. Makes one proud to be a liberal, huh? This is just a consequence of the excessive focus on “identity” in politics: people are trying to claim some identity or another to signal their virtue. I understand the origin of the focus on identity on the left: the aims of defending civil rights and fighting against discrimination are noble ones. However an excessive focus on ancestry is a waste of time at best, needlessly divisive at worst. When it comes to blood quanta, and remote ancestors it’s better to simply let the matter slide. Lots of African Americans have European ancestors: does this mean that they’re all white? Vice versa, some “white people” in the US have some Native or African remote ancestry…again, does this make them “black”? This attitude towards ancestry is likely a consequence of old racist laws and principles (like the “one drop” policy) that were created to discriminate against non-white people in the US. Now some people think that the same standards of “one drop” ancestry can be used for a moral end, to improve the lives of the oppressed. I don’t think that’s the case, and we’re more likely to witness cringe-worthy claims of remote ancestry, like in the case of Warren or Ocasio-Cortez, which do not really matter, but make for great fodder for the right.